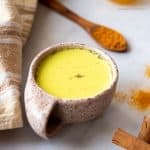 This golden milk is a healthy drink that’s perfect to warm the cold winter days. It can help you relax and to fight insomnia and that’s why you should add it to your Healthy Meal Planning. It’s a gluten-free recipe and can easily be adapted to a vegan version. Pour the 2 cups of milk into a pan and warm it up. Add the 1 tsp of turmeric, 1/4 tsp of black pepper, 1/4 tsp of ginger powder, and 1/2 tsp of cinnamon. Add the 1 tbsp of honey. Use a whisk to mix all of the ingredients. The golden milk is ready when it’s hot and before it starts boiling. * If you use vegetable milk, add coconut oil so your body can absorb the active principle of turmeric. ** If you notice that the spices remain on the surface, use a teaspoon to stir the milk before drinking it.